Without much time between teaching, job searching and graduating with a masters I barely had time to listen to podcasts never mine participate in one over the last few years. But proud to say I checked this off my list. What a fun half hour with Tim talking financial literacy. If you haven't checked out Next Gen's Personal Finance page you should:) Listen to us here. This pic was taken from the approach to Christ the Redeemer. 2.5 hour line in the 95 degree heat. No advance tickets or reserved bus times. A free for all! I have been quite fortunate throughout the years to have the opportunity to travel. Each journey, I takeaway something new and different. These take aways are dependent on the purpose, the itinerary, the goals, and the place I am in life. As an educator who focusses on building global competence in my students, it is not surprising that recent travels have forced me to consider how my own global competence is developing alongside that of my students. You don't have to go far... but you can. For example, in October my husband and I took a trip to Chicago to visit friends. If you think I am crazy for saying that flying to Chicago can be a learning experience that challenges your 21st Century Life Skills and Global Competence Skills then you have never travelled with Spirit Airlines. Perhaps it's the fact that you don't expect the different "way" of life that truly throws you off guard. Having thought we got a deal on our flights, we soon learned that we were going to have to pay for EVERYTHING. Seats, sodas, carry - on luggage. This isn't the norm for US travel and we were shocked. The culture of Spirit airlines was way different then anything we had even seen. The cultural challenge was even more so apparent, when we got to the counter to grab our boarding passes and the women informed us that we HAD to get our boarding passes from the computer behind us. The use of the computer to enable our travel was not an option, it was a requirement. While I calmly moved through this experience (personally pretty inept at travel technology) and furthermore the carrying of my luggage a few hundred feet to another security check (also not the norm) I could sense my husbands frustration in this new process and identified the need for flexibility and patience in this new situation. This was just a precursor and reminder before the big trip. Fast forward two months later, and here we are in the airport of Rio de Janeiro. Let's state the obvious, we knew that without more then "Bom Dia" between us in terms of Portuguese language skills, this was going to be a sometimes interesting experiencing as we pointed, gestured and laughed our way through communication for the two week journey. But what other cultural/global competence skills did we learn and or practice? Let's take a look. World Savvy, defines global competency as, "the knowledge, skills and disposition necessary to navigate and succeed in today's interconnected world. Globally competent individuals are life-long learners, have a an appreciation for cultural differences, an ability to understand and consider multiple perspective, critical and comparative thinking skills, problem solving abilities, comfort with ambiguity and change, and understand globally significant issues". 2 square miles for 800,000 people - No wonder people get frustrated. Classroom at the after school resource center. My trip to the favelas of Rio (Tour Company) was also a powerful part of my trip and one that allowed to me really see the issues of poverty in this country and it's interconnectedness to other human issues. My tour had a focus on education. The goal of one the favelas was to provide community learning spaces that allowed the students a place to go after school for a safe learning environment to do homework with assistance, play with others and receive tutoring they may need. The goal of the second was to make athletics visible. Encouraging kids to participate as a means of keeping them out of trouble on the streets. On this journey through the favelas I learned about education systems, poverty, human rights and crime. It challenged some of my assumptions and allowed me to connect many of the issues of Brazil to other places I have travelled in the past. Perhaps one of the most immediate connections to my class-work with micro-finance was what I learned about Azul Airlines. Brazilians were constantly dealing with the long bus journeys across this vast country to visit family. However, Azul Airlines, founded by the same man who founded Jet Blue decided he needed to give more access to his airline to reduce this long travel time. He created a program that allowed people who were able to book advance travel to pay for it over a ten month period of time. Because so many of the people living in Brazil had a hard time saving the bulk of the money up front this allowed a payment plan that allows for people to enjoy more of their time. I still look forward to working this into a conversation with the boys at school and for them to think about it as it relates to social entrepreneurship. I would be amiss to say I could tell all the stories of this trip in a blog post. So on the short end of things I am certainly more inept in currency exchanges, times people eat, drink and dance, the culture of the beach, local activities, and Brazilian food. I was amazed at the amount of steak and potatoes I consumed, alongside Italian fare and of course the filet de peixe (the best was right on the beaches of Buzios). I also encourage you all to try a Caipirinha. I know now that traveling for Christmas to a Christian Country comes with the knowledge that it might be hard to find a place to eat on Christmas Eve and Christmas Day. And that Rio for New Years-if you don't plan to eat on the beach-think ahead due to closures. And, that a "direct" bus from Rio to Buzios does NOT take 2.5 hours (rather close to 5) depending how many people approach the bus driver and ask to get off at random exits along the way. I learned after a challenging trip on the water due to claustrophobia that you might want to pay the extra $10 for the boat trip if it makes the difference between sharing space with 150 people vs 12. And in general to ask more questions, make little assumptions. And yet most importantly, I know that I am a better person for waiting in the long lines of Christ the Redeemer (patiently as possible for all 2.5 hours-No they aren't ready for this summers crowd there), soaking in the Rio Sunshine while communicating with the people of both Brazil and the many other travelers we met along the way, taking the time to learn about the favelas and engage in conversation with the people living in them, not being fearful of the homeless or beggars (we have them here too), or the safety of my person or belongings (despite the fear people tried to instill me ahead of time) and for challenging my self to order things off the menu that I had no idea what they were. I must say, that I have enjoyed being a student thus far. From Self Efficacy to Motivation and everything in between I have been able to reflect on the work I am doing and able to consider how it applies to educational leadership. It's been quite a journey. Who knew I would need to re-learn MLA format? My major project for the semester was entitled, How does the use of Project Based Learning (PBL) as a teaching method enhance students’ global competencies? If you'd like to see what I have been up to check it out here. How does the use of Project Based Learning (PBL) as a teaching method enhance students’ global competencies? The Places We Go... Together. Having just finished up a twitter chat on #whatisschool about PLN's, it seems like a fitting time to reflect on my last few weeks of professional growth. While it's been only a few weeks since I was in the frozen tundra of Boston at Nais's Annual Conference, coming to terms with the inner Mass Girl that I am, it seems like ages ago as I have spent my days longing for a day off in this 70 degree SF weather. But alas... I have a moment to reflect. My first few hours at NAIS were spent in the presence of some amazing global educators as we chatted about Global Project Work and Connections and considered Driving Questions. Cheers to Town School for Boys for having 3 out of 4 driving questions from the presentation be from our school. Listening to Hindo speak via video about change makers and his commitment to his community was inspiring and left me wondering how we can continue to work together in years to come? The conversation, debate, about what is more important for us to work towards combatting, measles or ebola, really allowed me to look at both glocal and global impact. All in all, it was simply being in the presence of likeminded folks that got me excited for what was to come in the days ahead. Everywhere I looked at NAIS I felt as if I was running into someone I knew. Whether it was the folks from Harker, Town or my Teachers of the Future group I was constantly engaged in updates about classrooms, new positions, ideas and personal life check in's. Being at NAIS always reminds me that I am part of something that is bigger than myself, and my school for that matter. And as I sat in the audience of the keynote speakers each day surrounded by 4,000 to 5,000 other independent school community members, I felt just that. I always reflect on NAIS as a conference with a few immediate take aways but more importantly an opportunity to reflect on the big picture-the vision- and create new relationships and build on longstanding ones. This year was no different. While sitting in the panel discussion with University leaders, I was engaged in deep thought about whether K-12 education can truly be transformed without the lead of universities. It was provoking. Who will put their hands in the air and say, let's try this and who cares what the top universities think? How will this set our students up for success? How will we transform students thoughts about what makes the best university for them? It resonated with me when the President of the University of Southern New Hampshire remarked that because his institution has less history, alumni, etc it has more opportunity for innovation. While it makes sense, it is certainly a sad reality. I watch young students strive to get into schools that they consider, "the best" and fear that they are not being taught the skills to be "the best" post graduation. And even if they are, is it the only option. I recently read this article that further confirmed some of my thoughts. After last years annual conference, I recall being struck by the absence of women leaders at the conference and the lack of conversation about this. I guess I wasn't the only one, as it appeared that every session had something to offer in terms of women in leadership at independent schools. I joined a packed room to listen to women leaders talk about the balance of admin life, families and the skills of which women need to nurture in themselves to be competitive in this market. In the end I felt like I had just walked out of a pep talk, and one I desperately longed for, even if I hadn't known it before. My immediate take away came from a presentation with teachers from the Blake School, titled Grading for Global Competency. They spoke from experience about what it means to grade skills and the conversations of which they were engaged in while in their classrooms. The support of the admin was clear and I was convinced in the end that my rubrics for projects shouldn't combine the skills with the content and that it would be easier to talk to the boys about their areas of improvement if I was to find a way to separate the two. I especially think that bringing a grade into my 6th grade class for coping and resiliency and a deeper more meaningful look at communication and collaboration are key to the future of my "Kiva" project. In pushing forward, I am going to spend more time deliberately grading skills and in fact redesigning both my grades and report card to represent what is really happening in my classroom. I could go on and on about the wonderful people, sessions and casual conversations I had. Topics included faculty compensation, blended learning, global education, headmaster searches and what's next for my career. While I didn't bring home the answers, I did bring home the questions to ponder and work through with the amazing people I consider part of my PLN and my NAIS family. While a few key members were certainly absent, all in all I am simply looking forward to next year as they join me in San Francisco. A few months ago I wrote about my blended classroom. However, the post has been edited and placed in a two part series on the Independent School Magazine Blog just in time for this years annual conference. See below. Stay tuned as I anticipate a whole lot of learning at the NAIS Annual Conference this week and I can't wait to share! 6th grade boys tackle interior angle measurements using video instruction at their own pace. While I spend most of my time telling "Stories from the Garage" and giving you an inside scoop on what's happening in my classroom, over the course of the last month I led the charge in creating our first ever Global Town School newsletter. This is simply a snapshot of some of the wonderful glocal and global projects and lessons happening in our community. Take a walk through our halls and enjoy our stories. Having been nominated and selected as part of the 2014-2015 NAIS Teacher of the future cohort, I am currently looking at my classroom in new and exciting ways. As you may recall from my earlier post this summer, the topics that this year's cohort will examine are Blended learning, student health and well being, assessment and accreditation. I had the pleasure of working with a small group , from within the cohort, to lead our discussion on blended learning during the first 6 weeks of the school year and it was quite an experience. Here is my journey and my review. Blended learning. What does this term mean? Is it an online course? Is it a flipped classroom? Does it work for kids that need more support? Is it better for the kids who need less direct instruction? How will it make my classroom a better space for learning? How will online learning increase my teacher to student interaction time? I had questions, many of them. In fact, too many to list. Living in a glass-walled, garage classroom, what I do in my classroom is transparent to the everyone walking by. From goofy games, to white board work, online practice to group problem solving activities, assessment days to group huddles, what is happening is generally pretty clear. So when challenged to try out this concept of Blended Learning during the first few weeks of the school year, I found myself compelled to be transparent to all. While I do not know that blended learning is the solution to education and or the classroom fix for all, I did know that I was going to give it an honest try and I wanted to make sure the stakeholders were aware. Knowing that I wanted to create a space that was easy to store lessons, worksheets, ideas and gather feedback from my students, I followed the advice from this summer's meeting (Michael Nachbar suggested 3 tech tools-don't spread yourself thin) and decided that I could likely accomplish most of my technology goals by combining educreations, socrative, and IXL under the portal blendspace.com. Challenged by the "who" this would work best for, my Core level 5th graders or my Core + 6th graders, I struggled at first with whom to take the initial plunge. I went with my gut and tried it with the 6th graders first. I hoped to discover the benefits, and then manipulate and change it based on the age and needs of the 5th grade class. Blended learning wasn't entirely new to me. I had used flipped instruction in my classroom in the past, and I was quite familiar with the technology tools that would allow me to accomplish what I had hoped. I was already a believer and do'er in terms of student centered learning with vast experience in PBL. But I was trying to make my class differentiated in a slightly different, more permanent way. I didn't want this experience to be a "one off" differentiated challenge by choice day. I wanted to engage in this head on and right away. I wanted to set the tone for the year. Two weeks into the school year, and the day the ipads arrived in the 6th graders hands, we were off and running. Using Blendspace, I created a portal of videos, IXL links, deeper level problem solving worksheets and learning goals itinerary for the unit. The boys knew up front what they needed to accomplish and by when, but they were given choice and voice on how to accomplish this. They began to understand and acknowledge which tasks were easier to accomplish at home without the support of their teacher/coach and their fellow classmates, and most importantly which of the tasks would be completed more successfully with support. They were in the driver's seat. Many students love projects and while Unit 1 wasn't really designed as a project, the boys offered feedback that because they were making choices and driving their learning they felt like it was one big project. The level of engagement was higher than I remember from past years. The videos helped me understand the concepts and I can watch them over and over again if I need to. When you come to our small tables to check in I feel more comfortable asking questions. I feel supported in the group of 3 and I don't like asking questions in front of the whole class. It was great that when the teacher was out sick, she could continue to track our progress, and we could continue our goals. It was as if we didn't miss a beat. As the 6th grade boys moved into their second unit, designed mainly as a PBL, I decided to engage the 5th graders in blended learning for unit 2. Knowing that the 5th graders would need more structure I knew that I needed to set things up differently. Instead of the 5th graders approaching an entire unit with multiple goals to accomplish alongside their peers and with support of the teacher, I used Blendspace and my tech tools to create daily lessons based on specific learning goals. I taught the 5th graders how to use the videos that were assigned as homework and/or classwork. It was important to point out to them that while these videos might not lead to mastery of the material in one viewing that with some time and careful review they should be able to gain an introductory level of understanding at the very least. To verify this, I used multiple forms as entry tickets. Sometimes the boys entered the classroom with a ticket from the evening before and other times they engaged in a quick formative assessment that allowed me to group them for the day in terms of their level of understanding on the concepts from either the day or evening before. An example of this was a lesson on adding and subtracting decimals. The boys watched a video at home the night before class that reminded them of how to add and subtract decimals. It included multiple examples that emphasized lining up decimals, borrowing/regrouping to subtract and what to do when it's a whole number minus a decimal. The boys entered class and I informed them of our leaning goal, "To be able to add and subtract decimals with regrouping". Using socrative.com I soon discovered what each boy had retained during their viewing of the video the night before. Using the computer generated data, I was quickly able to place the boys into groups. Group C) Boys participated in an activity on completing and creating Magic Squares. You can find these in the blendspace here. Check it out #'s 1-8. The boys all know how to do the concept now and no one was bored during class. Boys were asking if they could do some of the other level work outside of class. Boys that needed a little direct instruction were now feeling that they could work through Group C work and were excited to try it out on their own. While grading assessments both formative and summative, the boys enjoyed having direct blendspace #'s of which they could return to for review and practice of the concept they missed. Here it from them here! It felt like I jumped into the deep end at first, not sure if I knew how to swim. However, it was exciting to see the boys think differently, work through concepts together and develop skills that will likely enable them to be independent, life long learners. And after the first summative assessment, I was quite positive that we all handled that deep end just fine. I am so excited to have tried it. Be transparent with students, parents, administration and colleagues alike. Students enjoyed being able to see the different levels of the learning goals and it motivated them to work harder. Parents enjoyed learning how to support their child and no longer wondered why their boys weren't doing more "drill and kill" assignments at home and how the video complimented instruction not replaced it. Administrators and colleagues are supportive and available to bounce ideas off of with better understanding of what is happening. I was able to understand the learning styles of my students faster this year because I was working closely with them daily. I didn't have to wait as long for students to feel comfortable coming to extra help or asking questions during full class instructions and discussions. I was visiting with them in small groups and seeing what made them tick academically and personally. By using blended learning methods I had more time, and sooner. My role as a teacher has changed. I consider myself more of a facilitator of instruction, allowing the boys to teach one another with my support. The boys gain greater understanding through this instruction and are able to better communicate their mathematical reasoning and knowledge. I feel more like I am part of the class. As I sit with small groups to sweat through problems our relationship develops. I am able to work with them on skills in ways that I wasn't before too. Communication and collaboration instruction and feedback is part of our daily routine. The boys are discovering more about themselves as learners too. If a student doesn't do the homework it can be very hard from them to fully participate in the class. In a traditional class this is also true. But in a traditional class the student generally sits through another period of direct instruction on the next concept and was sent off to do independent practice. In this model the students are jumping right into class, sharing with classmates, and are expected to have some baseline knowledge from the homework. It can be difficult for the student to participate in succeed in this model without having done either the video or baseline practice the night before. When the tech doesn't work, the class doesn't work. Nothing more frustrating then having the boys get a message on their ipads that blendspace is down. As I move forward with the cohort in the months to come, I am excited to take more risks, try new things and continue to reflect on Blended Learning in my classroom. I recently led a google hangout, which you can find here. Dear Friends and Family... this Ebola thing is REAL. These are my thoughts and connections. I ask nothing other then for you to understand that I am scared for Town's friends in Bumpe. Using community skits to teach about Ebola. It's scary. The media is finally doing a better job of sharing with us the fact that Ebola is real and it is deadly. We may finally be listening. We are learning more and more, day by day, and it is getting closer to home by the hour. With every scare and every case that exists in the US our world and personal health feels compromised. However, the way to stop this pandemic from really tearing across the globe is to go to the source. Western Africa. I recently stumbled upon this article written through the eyes of a 13 year old. Maybe it was because it was through the eyes of a 13 year old that really hit me. I work with 13 year olds everyday. But perhaps truly it's the connection I have with a group of students and my friend Hindo in Sierra Leone that is making this more real. If those students, who wrote these word problems for us last year, come down with this disease, how will I process this? More importantly how will I explain to my students? My 13 year olds? Life isn't fair doesn't exactly cut it. We talk about the birth lottery in the classroom (great example here), and how just by coordinates of latitude and longitude where you are born determines so much. What did West African people do to live with this fear? Live without access to healthcare and disease prevention? Perhaps they were just born. Hindo and friends sharing how to keep safe. Here in the garage we talk about the UN Millennium Goals often. We discuss how interwoven poverty, healthcare, and education are and how to combat one without combatting the other is impossible. What is going to wake us up? The goals are lofty, we haven't solved them. How can this pandemic make more people aware, concerned and willing to act? What will it be, The fact that the price of chocolate is going to go up because Wester Africa is the largest provider of cocoa beans? I hope that the reason you are reading this is not a financial one, not a worry about cocoa and diamonds. Their are people dying at rapid and exponential rates. Financially speaking we just need to remember that money goes a long way in these struggling countries. In fact, your cup of Starbucks every morning could be the amount that saves a family. Being in constant contact with Hindo, I am absolutely amazed by his stories and pictures. They feel upbeat and hopeful to me as he concentrates on keeping his area of Sierra Leone safe. He's a warrior. The community is full with warriors. So I write because I want to tell you a little bit about Hindo, his family and our work with Bumpe. Hindo is my contact in Sierra Leone who assisted Town School's connection to a school in Bumpe, and he continues to orchestrate global connections for the benefit of school communities. We discovered Hindo through World Leadership School. We learn so much about the world from these global connections. But Hindo is not an educator by trade. Hindo, in his early 20's, is studying law in Freetown. Excuse me, WAS studying law in Freetown. (You may be aware that all schools in Sierra Leone are shut down. Fear is rising that this will increase many things... high school drop out rates, pregnancy rates, and orphan rates to name a few. In an effort to keep kids educated they are launching "Radio" School. Not a perfect solution, but better than nothing) Hindo is not abandoning ship and leaving Western Africa. Hindo is staying to support his community and educate them to be safe. A community board to share updates. Hindo's parents are teachers. His father is the principal of Bumpe High School (what used to be a premiere boarding school in West Africa before being destroyed by the Rebel War) and his mother started the first Kindergarten program in Bumpe. Bumpe's father is an educator by choice. In fact, he is the eldest son of the late paramount chief of Bumpe Ngao Chiefdom and his brother is now Chief. He would have been the Chief, but he chose another path... education. Hindo's sister (shares the blood of his father), Sara Culberson, lives in Los Angeles California. Sara was raised in the US by an adoptive family. She shares her story in the book, A Princess Found. How have we connected here at Town? Last year not only did we, the 5th and 6th graders, connect with Bumpe in math class, but Kindergarten classes exchanged idea about what being a kid is and worked together on children's rights. You can read more about it here. Amazing stuff. In Science class, the boys also exchanged information and questions relevant to their class. This was all thanks to Hindo and Jennifer Klein of World Leadership School. You can read about Jennifer's adventures to Sierra Leone and her time in Bumpe. She was their in MARCH. She has two columns of interest.... here and HERE. I share these facts about the family, because I trust them and their mission and I hope that by understanding more about them you will too. I say that Hindo is not an educator by trade, but he is most certainly an educator. Hindo is doing everything to keep his community safe by educating them. You can learn more about this current efforts here. Perhaps give even $5 to support in a VERY direct way. I enjoy getting updates from Hindo via facebook and the pictures of the community banding together to stay safe is inspiring. I only wish I could do more. I write this letter to share my passion for what is a very sad thing occurring in this world. The US is faced with it's own level of fear and potential health issues regarding Ebolo. The truth is, we can't turn our back on West Africa. While we may opt out of a weekend jaunt to avoid discomfort and fear in boarding a plane, Sierra Leone just finished a 3 day curfew/lockdown to help identify cases and locate scores of bodies. Let's make sure to recognize that this scary pandemic will not go anywhere if we can't find a way to band together. During a time when I was looking to take the next step in globalizing my classroom, my paths crossed with World Leadership School. Often feeling alone in my classroom, with few to collaborate and communicate with on my curriculum and it's global connection, World Leadership School came along and provided me with just the support I needed. In the summer of 2011, I fully engaged with WLS by attending a professional growth trip to Chilamate Costa Rica (see blog posts). While initially I thought that what I would take away from this trip were global connections, I soon realized that the impact would be far deeper. While I didn't find a way to bring the community members or the students of Linda Vista directly into my classroom through Skype or classroom projects, I could tell their stories as we investigated microlending, education for all and global poverty. Through my stories and greater understanding, my projects began to grow from what I thought I knew about people living in different areas of the world to what I learned from living with them for 10 days. Participating in the VTI, I was able to process new ideas on global projects, gain feedback from a seasoned and valuable coach, successfully fall, and get back up again. Jennifer helped me create situations for the boys to develop greater empathy while digging deeper into my math projects that focused on poverty, helping me find new partners for my global word problems and creating new and interesting ways to bring global into the daily routine. Most importantly, she encouraged me to keep on my path. I finally realized after the year that global was no longer the "dessert", it was the main course of my math class. Entering our 3rd year as a school with WLS I have first hand seen the boys develop greater knowledge, empathy and respect for others. I have watched teachers further develop country studies with 1st graders that focus on cultural understanding, the rights of children be discussed in partnership with Sierra Leone in kindergarten and 3rd graders. Through these projects and connections are community has grown stronger locally, glocally and globally. If I compare my journey with WLS to a technical rock climb, WLS belayed me on course. Jennifer provided me just the support I needed. During my VTI coaching I was encouraged by my belayer to take chances, knowing that even if I fell, it wouldn't be long or hard to get right back up and continue to climb to new and exciting places. How to scaffold “global” into a new teacher. How to best keep people on board that have participated in WLS coaching/travel. How to equip us with resources and talk about ways to organize resources and ideas to share with the community. Identifying gaps in the Town School community in regards to global learning and find ways to gently help fill them. This is the summer of "me", which means relaxing, chilling, reading and sleeping. But if you know me, I have a hard time slowing down and not being a complete workaholic. And, this weather is not helping either. San Francisco = No fun in the sun. Hard to get into a beach read when it's not sunny. As a school that uses google drive for just about everything I was excited to view this tutorial and learn about how I can make google forms be self graded. This will be a great way to have the boys work through short problem solving activities, graded warm ups, entry events and formative exit tickets. While I don't always ask questions that have only one solution, when I do I can see this being an easy way to not only grade (for me) but to offer immediate feedback (for them). I like the set up of google forms as they are easy to create. But I do wish you could not only see responses in a spreadsheet but also as a single student response sheet. Please Google!!! While participating in EdmodoCon Wednesday, @grammasheri recommended Blend Space to me. I was immediately intrigued and found it to be a really easy to use interface. Perhaps it's the word "blend" that got me after my 3 day conference on Blended Learning. In all seriousness, the fact that it has tabs to link educreations, web pages, google drive, and youtube sold me. I can't wait to try my first fully blended unit using Blend Space and have the boys complete it self paced and as differentiated as we need. Might even find a way to use it for Back to School Night. Let's see! Tackk is a very cool site that allows collaboration using a similar interface to my web page (square space). This automatically made it nice to work with for me, familiarity is always nice. I think it could be one of those tools I introduce the boys to that will allow us to work together creatively to share our thoughts and message as we travel through global learning experiences. We will continue to process with Edmodo but things we can share with others could be done easily with Tackk. This could also be a good way to share our wor(l)d problems with other classes. Classes from around the world could collaborate on the Tackk, share their questions or thoughts too! The images available to insert are great, we could embed video for others to see. In fact, the more I think about it we could probably incorporate it into sharing our message with others in MANY ways. I worked through a little demo here (you can also see it below). I went basic. Check out Tackk in the Classroom Video for ideas too. So maybe it's not the most interactive website on the list but it's a cute way to change regular text into something fun. For me, I can see making fun announcements for the boys. For the boys it will be put into the list of "tools to try" as they get into running their own business. It could be used for creative advertising or announcing sales and business updates. For years I have tried to use Lino in my classroom. Whether it be with the boys, or in professional development, something about those stickies just hasn't stuck! Yes, a lot of times with the boys I want to get "messy" with real sticky notes and chalk talk paper, but something about this website Padlet stuck with me. It could be a great group brainstorming tool, or as we did at NAISTOF a way to share an end of class "nugget". I love finding ways to get the boys to share without using their voices all the time and this is another tool for the tool box. Perhaps it's simpler in it's interface? Most importantly I like that it can shared in a variety of ways: image, pdf, excel spreadsheet, and more! Padlet claims: You'll feel like a superhero? Sold. Who doesn't want to feel like a superhero? Last but not least...having used socrative.com for years I am calling this my +. Because if you counted, you will notice this is my 6th tech tool. However, socrative got an "up do"! It's moving on up and I am excited about what I see. While google forms can now be self graded, socrative has always offered that and more but with the need to be "live" with your class. It's a little harder to give as a homework assignment as the teacher needs to keep the room open, but it does enable you to look at one student's report. I love having the kids do an appropriate space race challenge and the new quick question will be great for off the cuff questions that come from in class discussions that I want individual responses from. So that's a wrap! 5+ tech tools that I can't wait to incorporate into my classroom. Notice that none of them are "math" apps. Rather ways to share, collaborate, and create. What are some of you go to tech tools? I would love to hear. #NAISTOF Reflections: Bottle it Up and Save it for Later? Writing a follow up blog about my 3 days with the #naistof crew has posed to be more difficult than I imagined. Sifting through my notes, recalling the many moments that I was in awe of others, enthusiastic about a connection, or learning something really cool has led me to a place of complete overstimulation. I often ask my students after projects to put their thoughts and feelings into a headline and so I have decided to start there. If I could bottle up all the wonderful enthusiasm and energy from that 3 day conference, it would certainly last me for the entire school year. The good news is that I don't have to do that. Because while I felt that our time was short, I am almost certain I forged relationships and connections that will keep me and the 2014-2015 teachers of the future cohort energized and alive for at least the next 10 months. Wednesday started off with a brief introduction by John Chubb followed by a 3 part activity led by Angela Chubb on Blended Learning. The three part activity allowed us to learn more about blended learning through direct instruction, collaboration and independent activity. It is clear to me that we need students to participate in a "blend" of opportunity, instruction, practice and assessment so that each student can reach their true potential. I enjoyed learning about lab rotation, classroom rotation and flex model as applies to Angela's model. During collaboration, we discussed a definition of blended learning, "Student is engaged in active learning at least in part online where they have control over time, place and or pace and in part at a brick and mortar location away from home", and a few thoughts came to mind. Blended learning to me is personalized, differentiated, student centered with teacher as "coach", and integrates technology. I continued to sit on those concepts as I moved through our day wondering how and if this is already present in my classroom. Standards plus 2: Allowed me to forgive myself for sticking with not always getting crazy with new apps and sites. Time to Reflect: This made me think about my blog and the class edmodo site. It also got me thinking about "Friday Tickets" and an opportunity to allow the boys each week to give feedback on their weekly experience. Being Flexible: Is my must do/can do list working? I want to make them very intentional allowing each student to reach content success and real world problems. Organize with Purpose: Focus on planning the unit and the objectives before choosing the layout. This is definitely at times easier said than done as we are bombarded by new and interesting tech tools that we want to "play" with next to our students. 7 Minutes Tops: Keep my instructional videos short and sweet. Plan them out with clear objectives. Build in Formative Assessments: I need to prioritize this step this year. Perhaps warm ups and exit tickets would help? Become Comfy with Data: As a math teacher I am comfy with data, but how can I sift through so much? As I push forward as a theme leader for Blended learning (August to October) I keep my classroom design in mind and open my mind to what is to come. My middle school boys won't be following playlists for every unit, and or completing an online course in it's entirety but certainly we will be "blending" many things together. I hope to learn new and innovative ways to do this alongside the cohort too. I created a simple mind in 10 minutes (as to not obsess) and to capture my initial thoughts about what my classroom looks like in terms of instruction and learning. Thank you Teachers of the Future 2014-2015, Mentors, Faculty and NAIS as a whole. What a wonderful way to spend 3 days in July. I am taking all that energy and pushing forward into the upcoming school year. Thanks for joining me! Today was a fabulous day at NAIS Teachers of the Future conference. While we mainly focussed on introducing ourselves and acquainting ourselves with the schedule and purpose of our time, both here and during the year as a cohort, I was inspired out of the gates. If you are wondering what NAIS Teachers of the Future is all about you should check it out here and continue to follow my blog about professional adventures and follow our group at #naistof on twitter. I am sure to have plenty of other resources and must follow on twitter folks for you too! It's only day 1. Initially, I was a little confused as to the connection of the themes (Blended learning, Student Health and Well Being, Student Assessment, and Accreditation) of this years cohort. However, I was quickly enlightened and had my AHA moment. If we are going to move towards a blended learning mentality in our classrooms, then we obviously need to consider how that will play out in these other aspects of classrooms and schools. It made me think of my own personal struggle during my faculty assessment year in 2013. It's not just the classroom and teachers that need to evolve. As John Chubb President of NAIS so wonderfully stated, "Independent Schools have to do better than sustain, they have to grow, lead and innovate". Thank you John Chubb for providing us a wonderful introductory "key note" about great teaching. You set a tone and inspired me to make these next few days great! John Chubb's reflection on TOF conference 2013 can be read here. Unlike past summers, I made a conscious decision to “slow” down this summer, take it easy, hang out in San Francisco and focus on me. While I am not going to lie, it’s had its’ challenges, it’s been good for the soul. Sure, I would love to be traveling the world, discovering new places and people, and growing professionally through those experiences. However, I am embracing what I refer to as “Summer of Me”. The Glen Park Canyon is really in my backyard and can be a great place of solace and a wonderful place to get my “outdoor on”. Trying new recipes from scratch and experimenting with new ingredients is really fun. My hammock is one of my favorite places in the world. Booking a spa appointment is hard. Wondering, will it still be foggy that day? Will I be in the mood? How much “me” time is it going to take up? Laundry, a workout, trip to the grocery store and cooking dinner really can be accomplished between the hours of 3-7. But trying to do all that in such a short period of time can cause stress. Hold off on the laundry. It will still be there tomorrow. Twitter conversations with collaborators around the world are way more fun while sitting in my hammock. I took a trip to Boston for 2 weeks where I enjoyed good summer sunshine, trips to the beach, World Cup Soccer games, time with family and friends. I hit up a Lady Gaga show, ate at my favorite spots in Boston and ate great lobster. I celebrated the 4th of July with 5 days in San Diego. I got crushed in the waves, got a little too much sun and enjoyed some well deserved rest time alongside my husband. I saw old friends, and enjoyed the small town of Encinitas. An overnight in Calistoga? Feels a million miles away and is just a short drive to the warmth of Napa Valley. Opportunity to really have the time to rediscover twitter chats and my professional relationships on twitter. It has been a god sent. Time to interact, not just retweet, and favorite. I read articles, bookmark sites and gather resources that will help me be a better teacher, coach and collaborator next year. #whatisschool has enhanced my summer. Who knew? Online learning has been my friend. I have challenged myself to participate in webinars and other tech adventures. And while perhaps a part of me is sad that I am not traveling the world as I have for so many summers in a row I know that being on my own watch, being in my hammock, and getting in a lot of rest and relaxation is exactly what "Summer of Me" is about. I have to admit, I am cheating. I am on the plane to DC about to embark on a 2 ½ day professional adventure that I am stoked about. Nais Teacher of the Future cohort 2014-2015…. Let’s Rock this! A delayed but important response... Getting to know me "homework". Back in December I received a "chain letter" better described by her as "homework" from my friend and one of my favorite collaborators Diana Williams. As the responses piled in, the assignment hung over me like a bad dream that I just couldn't shake. How could I realistically accomplish this with all that was going on? I am barely on twitter these days with all the other responsibilities I find myself boggled down with. I will just let it go. Just like everything else on my To Do List in the "B" Column. So last night, as I am shutting down twitter and reading a blog post about followers. It got me thinking. Do the people who follow me know anything about me? I want to collaborate more deeply with my connections but can I if we only "hang out" at the surface? So...I recalled this homework assignment from Diana. And because I have more time on twitter this summer, and because I am growing my PLN and embracing new relationships I thought... perhaps I should share a little more about me? Not the information on my linkedin, about.me or even my profile page on Stories from the Garage. But how about the things that go beyond who I am as an educator and talk more about who I am as a person. So I thought I would try it. I realize that in keeping my social media "separate" but "equal" I may not be doing my part. 1. I am a die hard Boston Sports Fan. My first love is the Patriots because I can keep up with their schedule more effectively from San Francisco. But I cried tears of happiness when the Red Sox won in 2004, I cried in on the way home from both Superbowl's that "we" lost to the Giants and I listen to Boston Sports Talk Radio on the way to work in the mornings. 2. I am very, physically active and athletically competitive. However, I am always humbled by bike rides and yoga. Jorts and flip flops on cruisers passing me on my road bike causes me anxiety and the instructor in yoga saying, "remember it's not competitive" never sits well for me. I will get that pose next time, I will! 3. Other than working the dressing rooms at a department store in high school during Christmas time, I have never had a job that didn't fall into the working with kids and educating category. Swimming instructor, Sailing teacher, overnight counselor, outdoor trip leader... if I wasn't going to be underpaid and overstimulated the job clearly wasn't for me. 5. I miss the seasons, but I don't miss living in the seasons. I love that I always get a few weeks of New England summer every year. Thanks to my awesome family for always hosting me. Lobster, Red Sox, humid nights, sundresses and the beach. 6. I am afraid of cats and snakes. I can't even be in the same room with them. 7. I love to travel. I love coming home. I have been fortunate to travel a lot of places in this world, but their is nothing like that first night in your own bed. 8. My favorite day of the year is that first Monday in June in when you don't have to go to school. Second to that is the Tuesday. No joke. I work hard and believe in the need for a break. 9. Is it ironic that the year I truly transformed my classroom globally I married a man with an EU passport? 10. I never thought of myself as a city girl. But there is something to be said for being able to walk wherever you need to go, and learning to live in only the space you “need”. I do prefer shopping in the suburbs with free parking. 11. I could not go back to a flip phone. However, when I travel abroad their is something refreshing about being less connected. 1. If you weren’t in education, what would you do instead? I would be involved in professional sports. Sportscaster? Sports photographer? NFL coach? Sports psychologist? Perhaps I have been chillin' with the boys a little too much but seriously this is how I would want to spend my days. Very much depends. Writing in my plan book? Pencil. Everything else? Generally pen. But I am the kind of person that never has enough of them. I end up correcting in just about whatever I can find. Markers, crayons, colored pencils... etc. Left Neglected. I am also reading The Art of Coaching at the moment as part of some professional growth for the summer. Microwave popcorn with spray butter and Lifetime Movies. These are not necessarily together, but two of my faves. 5. Has tech made your life easier or harder? For the most part easier, although I am sometimes stuck behind the screen inappropriately and my husband will begin questions with, "Without looking up on your phone" so we can still debate things. He really needs to start asking driving questions that are "ungoogleable". 6. If you could give your younger self some advice, what would it be? Get that masters degree. Life is unpredictable. 7. What is your favorite blog to read? Always inspired by the William Ferriter. I just saw that he wrote a good one about value of people and not just content today!!! Bill are we thinking the same today? 9. Would you ever wear orange pants? I have word pants. Not sure if I would do it again. Although I also heard people say how ugly birkenstocks are and I just read they are back in style and people are buying and wearing them! 10. What is one thing you hope to do in the future? 11. Favorite thing to do on a Friday night? Leave my classroom by 5:30 with no work in my hands, hit happy hour and get to bed early. My twitter page is all about my professional learning network. It's the place I go to exchange ideas, discover new connections and learn more about the people and profession of education. I am not going to tag folks on this "chain letter", write up a list of questions for you and pressure you to take some time to think about some of fun and quirky things that your list of followers might want to know . But, take this as encouragement to find a way to share something about yourself that will allow us to connect a little deeper. It will only enhance what we already have going. Tweet me! It's been more than six weeks since I was in Orlando, Florida at the NAIS Annual Conference. It's amazing how quickly time can go by when you are busy. February was such an exciting month all together, and yet I barely found time to sit still, never mind blog about it. So here we are, nearly the end of April, and I am getting ready for my next NAIS adventure. Nais: TABS Global Symposium. Time is going fast. When did this whirlwind begin! Having the opportunity to present at NAIS was exciting. Collaborating with like 3 like minded educators, across the country, in the hopes of putting together a presentation that shared our mutual thoughts, feelings and passions about Global Education and Inclusivity Education was fun, and sometimes challenging. In the end, the professional challenge made it all the worthwhile. Please feel free to check out the presentation, Getting to the AND:Building Inclusive Communities with Global Learning. NAIS also provided me other opportunities. I was constantly inspired by the people I spoke with, listened to, and worked with. While presenting Thursday afternoon meant that I didn't feel like I could fully engage that morning, Friday was thrilling, inspiring and professionally reflective. Heroes. I bought his book Heroes Among Us the following week. This is one of those days that I wish I could be "home". . Congrats to all those who ran and big "Cheers" for those who lined the streets and supported! What a city, What a day! Alongside John Quinones in his book, I recommend if you don't know the story of the Hoyt's you take a few minutes to check it out here. The marathon world just retired an amazing, heroic team! Opportunities and people in our life and how they shape our future. Who "made" me a teacher? Who helped shape me? Who inspired me to stay in this career? Throughout the last 16 years many names have come to mind when answering these questions. Students, teachers, administrators, PLN's, my parents... the list could go on and on. Today John Q, the teacher who encouraged me to do more is actually the first leader I felt like I worked under in independent schools. My school desk has always had a picture that reminds me of where I came from and who truly gave me my first "chance". That interview on May 25, 1998 (I know this because at the time I was struggling with adaptation to the real world one day before my 22nd birthday) at Storm King School is where it all began. Thank you Steve Mandell! Thank you for taking that chance on me, for helping shape who I would become as a teacher and for continuing to encourage me throughout my entire career. While it was a crazy few years on the mountain, I wouldn't take it back. I couldn't. Thank you also for sitting through my NAIS presentation like a proud "Papa" (Your words-not mine), asking good questions and encouraging your team to come too. It meant the world. I continue to reflect on John Q's questions, "Who am I as an educator? Who do I still want to become? Time will tell. But I am certain that I can look to Steve for any advice along the way. A personal connection to my 5th grade "Minimum Wage" project that I hope to work together with Humanities reading of The Circuit. This one hour workshop allowed the teachers of the conference to share knowledge, passions and problem solve. I was particularly excited about my two small chats with like minded educators on "What do we continue to do even though we know we shouldn't?" and "How can I be more innovative". These are great through lines of my practice now. Think about it. I had no idea what to expect. If you haven't heard of Eric or investigating this wonderful, global collaboration please go here. It made me reflect on how I want to continue to work through my global problem solving project and find more and more partners. Working together across borders to sing, play, and even do math will likely make us better global citizens. Reciprocity: "Responding to a positive action with another positive action". I could say the only reason I went to this is because my new friends of Pinewood (Steve Mandell is the head) attended my 1 hour session. However, that is not the whole truth. I just knew that something good was going to come out of this session. I knew that Steve doesn't let his schools work in unintentional ways and I knew that I was bound to be inspired. Having met a few of these people on my trip to Pinewood in S.C. last summer, I was intrigued to hear more about the power of their initiative and how their passions were turning into inspiring curriculum. This teacher spearheaded program that is showcased by newsletters, built on 3 tangible essential questions/global competencies and support is doing GREAT things. They left me with the following advice: Dream about where you are going, be flexible and willing to change, reach out and be openminded, honest, fair and inquisitive. The result through teacher leadership will be the development of compassionate and inclusive students and adults in our communities. Lastly, always remember where you started. Always remember where you started. Thank you NAIS for reminding me. Mele Kalikimaka is the thing to say on a bright Hawaiian Christmas day. It was that time of the year. For those of you that know me personally, you know that National Lampoon's Christmas Vacation has been a favorite movie of mine for half my life and that no Christmas season for me is complete without a solid viewing of the movie while reciting nearly every line. You may also know that I decided to return "home" for Christmas for the first time in 4 years to celebrate the holidays. Despite my love for the movie, or the number of times I have laughed myself to tears with my best friends about Cousin Eddie, I just never imagined in a million years that I would wake up on Christmas hoping that Cousin Eddie and his RV would show up outside my grandmother's door. Oh Eddie, where were you when we needed you? I have been there for you every Christmas! Joking aside, here's the story I need tell. On Christmas Eve, my dad descended the stairs to my grandmothers basement to put a few things in the laundry. Upon arrival he noticed that water which had not been on the basement floor earlier in the day had begun to accumulate. A few test flushes and sink turn-ons later, it was established that the pipe leading to the septic tank was in fact blocked. Likely frozen. It was about 18 degrees out at the time. For a moment their was panic. My mom reached for her cell phone to call my Aunt, I thought we were about to cancel Christmas. Packing our bags and heading "over the river and through the woods" leaving Grandma's house behind at 11pm on Christmas Eve? 10 minutes ago this was unthinkable, it was our last Christmas on Pinecrest. But what were we to do? Perhaps it's how Clark Griswald felt when he had just gotten the message that their would be no Christmas bonus. I was being stripped of the dream to celebrate our last Christmas in this house? The reason I had abandoned the beach holiday. And so it began... a pipe, a hand saw, and a strong arm, and we had all the water from the house draining into a very large recycling bin. Christmas was saved, we could all go to bed after a quick pit stop outside to relieve ourselves. Yes, that's right, OUTSIDE. As the next 36 hours carried on, I continued to have one thing on my mind, people in this world live this way. Not just the homeless in America or the people surviving in areas with recent natural disasters, but people all over the world with no other choice. I was challenged during the next 36 hours in a few ways. Remember the old rule “if it's yellow let it mellow if it's brown flush it down”? We tried hard to relieve ourselves in the woods during the day but waking up in the middle of the night was a bit tougher. So that was the rule. Mind you everything would end up in the woods anyway. We laughed and joked but 36 hours of potty jokes was really no joke. Shower anyone? This is something I have had the privilege of my whole life and I really wanted one. It wasn't a necessity but could we deal with it given the situation? We gave it a shot and shower I went. I turned the water on, jumped in, turned the water off. Shampoo in my hair. Water on rinse. Water off. Soap body. Water on rinse. Water off. Nothing about this felt like the shower that I take advantage of daily, but it was hot and it was clean and their was something to be said for that. Certainly I know that many people in this world do not have options to even this. And, it used less water than one flush of the old toilet. Upon completion of three of these similar showers my husband then had to go to basement and carry the accumulated water up a flight of stairs and into the yard. So despite the fact we had running water we needed to conserve. Everything we used needed to be manually dumped. A pint a pound my dad reminded us as we monitored the "bucket". We tried our best to conserve. Dumping the toilet water was certainly not sanitary but we had little choice without abandoning our Christmas in NH. Family Member 1: "Where you going all bundled up?" Family Member 2: "Just outside to relieve myself." This experience immediately made me curious. How can I bring this experience to my classroom? So I did a little research alongside my 7th graders who are currently researching the Millennium Goals. Perhaps you are aware of the United Nations Millennium Goals? Goal 7: "Ensure Environmental Sustainability" includes the following from the United Nations. Despite progress, 2.5 billion in developing countries still lack access to improved sanitation facilities. So, while we have come along way we still have a ways to go. This experience really got me thinking. Upon further research I become more aware of the diseases that become widespread from lack of sanitation facilities, the fact that education is lost because girls miss school because they won't go without private latrines especially during their menstrual cycles, and I felt sad that the country of South Africa that I fell in love with this summer is only at 74%. I also started to think about water conservation and how it directly and indirectly affects me. Hello California drought!!! Might be a lesson there, soon. How much water do you use? Check it out with this calculator. Access to improved sanitation facilities refers to the percentage of the population using improved sanitation facilities. The improved sanitation facilities include flush/pour flush (to piped sewer system, septic tank, pit latrine), ventilated improved pit (VIP) latrine, pit latrine with slab, and composting toilet. The statistics, TAKE A LOOK! We still have a lot of work to do. How can we help? In honor of the new year, not only do I want to share my thoughts, educate my students and hope that they want to create action but I also want to do something myself. Are you confident that a certain organization is doing it right? Please feel free to comment and suggest. And... stay tuned from the garage, a few 7th graders have really been doing a lot of research on some of these other Millennium Goals and I can't wait to hear how they want to ACT. The next "Good old-fashioned Christmas" is only 12 months away. Let's hope more people have access to clean water and sanitation facilities. 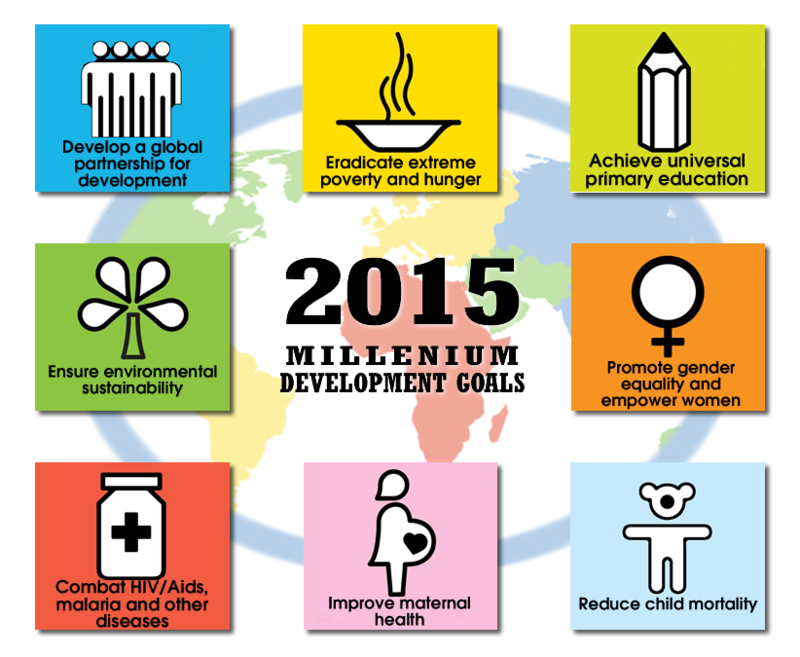 It will nearly be 2015, which my friends is also the target date for Millennium Goals! Let's be more aware. Let's try and empathize, let's give a little Christmas Bonus to those less fortunate. At the beginning of the year I read an article called "What Good Coaches Do" by Jim Knight. I was given it to reflect on as I embarked on a journey through teacher leadership and our new teacher group called Committee on Teaching and Learning which I was selected to participate in this year. In this article, Jim talks about Seven Partnership Principles: Equality, Choice, Voice, Reflection, Dialogue, Praxis and Reciprocity. The past few weeks as I have put myself in the driver seat, alongside many amazing professionals-peers, and I have learned so much. It was the term reciprocity from that first meeting that resonated with me, and now 2 months later it's reciprocity that continues to allow me to grow alongside these other principles. While I have not exactly been the teacher in all of the adventures that I am to reflect on, in most of these circumstances I have been in a position of leadership in some way or form. Jennifer Klein came to visit a few weeks ago and it was an exciting few days here on campus. I am so grateful for the opportunity I had to work with World Leadership School in Costa Rica and of course here at Town alongside Jennifer as my coach. For Jennifer's visit, I not only set up a schedule for her office hours, but as often as possible I sat in on the meetings to watch, learn and help coach. This was important to me as these teachers will likely need some follow up support in the months to come. Insert me. So many wonderful conversations to be a part of... so many ideas working through people's minds. My first meeting was with Chris. Chris and I have talked at length about connecting math and science on SOMETHING in the future. While we had the opportunity to do a short graphing unit together this year, finding the time to develop and work through a larger project has been a big challenge. I really want to support her project either by working through math and/or just being able to listen and learn from her experience. Chris is hoping to make her water project global and Jennifer was able to make suggestions and offer some potential contacts. I am excited to work with her in the weeks to come as learning about how Chris's mind works, her curriculum and her ability to work in reflection and understanding are amazing. Jennifer's day here also consisted of an after school session on GLOCAL. This was wonderful place to watch our community to come together and brainstorm how we can use this amazing city to connect our students to the greater. That said, we had visit from Justin at Kiva Zip on Monday and 6B decided today to go "glocal" with their first loan. They made their "grace" loan from Kiva Council a local one! We can't wait for Jennifer to be back in February and I can't wait to present alongside of her in February at NAIS. Jennifer's visit provided us an opportunity to really move forward on global initiatives and get people excited. It's led me to a few more opportunities to collaborate and learn from teachers here on the Jackson Street campus. A great meeting about how building empathy in theater can lead to more empathetic global citizens and better actors. A collaboration project with 5th grade Humanities using the book The Circuit alongside discussion of Livable vs Minimum Wage? It's just getting started. Reciprocity. This feels good. I am trying to enter each conversation as a partner, a partner dedicated and excited about global citizenship and the value of teaching with a global lense. A colleague, a collaborator and someone wanting to learn a whole lot more, that's me! My only fear is finding balance and time for me. It's been so busy, that I feel like I have hardly had a chance to think clearly never mind blog. But that said, a lot of amazing things were happening in the garage this week. This post is an opportunity for me to reflect on my professional growth as I have challenged myself this week in ways I haven't necessarily had the opportunity to do before and I think I am a better educator and member of my community for it. Monday we met as a group of teacher leaders, also known as the Committee on Teaching and Learning. I was scheduled to lead us through our discussion on leadership as it pertained to our temperaments from Keirsey personality test. The schedule was such that we would do an activity to illustrate the way we plan things, how we like to spend our downtime followed by a discussion about the strengths of our temperaments. 1) Have you seen students "pick their teams" as opposed to "be picked". I was always the athlete and growing up I didn't develop much empathy for the kid that was picked last. However, when at recess the other day I noticed that the kids were not using the traditional captain picks his team, but rather kid picks his team. How it works? Two kids move out of the pack first and go to different sides, then, one by one the students pick a direction (team) to go to. Each kids picks his direction, picks his own team. It's random who goes when and each kid has a sense of belonging for choosing his own way. It was a wonderful discovery and something I will definitely integrate into my practice if I ever have a need. 2) Faculty vs 8th Grade Free throw contest. For the past year I have felt challenged showing up at 7:30 on certain Fridays to be a part of the faculty vs staff free throw contest. Why? I don't want to be sweaty and gross all day, I don't want to get hurt, etc... but I could play and I had for years. But in fairness, I am not great at basketball and I don't really enjoy it. So I started to show up late and be a cheerleader. Well, this week at families we had a free throw contest instead. It was wonderful! No teams, throw in a skirt, who cares if you are an athlete. While all the adults in our community may "get" that it's tradition and be ok with not wanting or being able to play... this was inclusive. We all shot, and it was fun! We were a community, not the have and the have nots. Talking through the different temperaments with my peers was really important (despite the fact that in the back of my mind I felt that we had 1 hour together and I kept going back in forth inside wondering if this was truly the best use of time when we find it so challenging to find time to meet together). In the end it felt great to acknowledge the way in which we all come to decisions, deal with others and live aspects of our live. Being in charge of the activity and discussion made me really appreciate and be present with the wonderful team I am now a part of. I found myself consciously leaving out sarcasm and speaking quietly with less jokes, knowing that it could be read in many ways and being surrounded by so many idealists, intense in a different way. The meeting ended with me feeling great about the hour we spent together, and I felt like I was in a better position for the week to come. The next opportunity for growth came on Wednesday when I led a professional growth session for our school on "Social Media in Education"- Twitter! I love what twitter has allowed me to learn and accomplish. I love the people I have met and the relationships I am able to maintain. 140 characters of all out goodness! So I shared. 16 participants all eager to understand #, @ RT and favorite. It also gave me an opportunity to hone my skills for instructing peers and learning from them at the same time. We challenged the participants to take on a 7 day twitter challenge. Free dress for them and for their class/advisory? Come on friends!!! So what's next... in between all of this I have Kiva on my mind. Excited to partake and help lead a few sessions of growth at the Kiva U Summit this weekend. Stay tuned... Kiva in the Classroom... changed my career and it could change yours too.